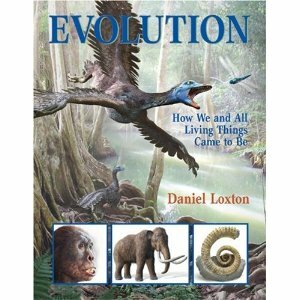 Evolution: How We and All Living Things Came to Be by Daniel Loxton. Kids Can Press. 2010. About: Evolution, for younger/ middle grade readers. The Good: Evolution, a tricky scientific concept, is described and explained in a way that is both easy to follow yet also captures the complexity of the topic. Colorful illustrations support the text; one of my favorite sequences illustrates how whales evolved from land animals. When questioning evolution, certain questions are usually raised. Including the eye question -- "how could evolution produce something as complicated as my eyes?" Illustrations and text explain just how evolution results in eyes, both the eyes found in humans and in other animals. It's not just science that is discussed; frauds are, also, including fossils found with both human and dinosaur footprints. It explains deciphering the footprints; and the pretend fossils that were created as souvenirs after. There is a glossary, but no bibliography. Luckily, their are online resources. The front matter explains that this contains materials originally published within Junior Skeptic, the children's section of Skeptic magazine. Information and reviews of the book are at the website. The author is the Editor of Junior Skeptic. Kids Can Press, the publisher, also has online resources for parents and teachers.